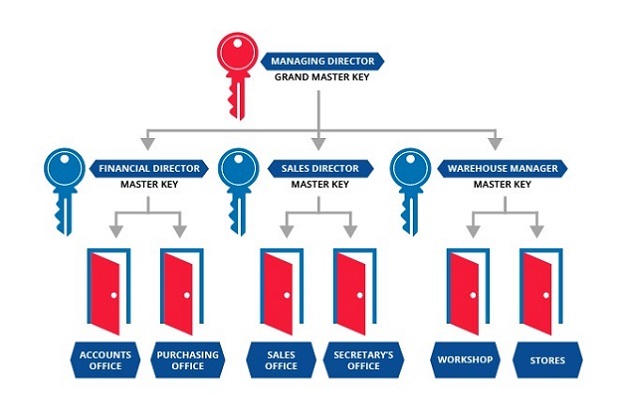 Restricted Key Systems, also known as Master Key Systems, are a simple and affordable access management solution that provided a higher level of security and flexibility that a traditional key system. Restricted key systems are ideal for small to large businesses or commercial and industrial property with multiple departments, multiple sites or multiple different users and access requirements. What are the benefits of a restricted key system? A strict control process ensures only an authorised people can request keys. BullAnt have extensive experience in designing, installing and maintaining restricted key systems. We can work with you to ensure the system design meets your operational and security needs and allows for future growth and flexibility. We have designed, installed and maintain restricted keying systems in schools, tafes universities, residential developments, aged care facilities, shopping centres, commercial properties, industrial sites, hospitals, local councils, government agencies and defence department premises. With master keying comes the need for greater key management. Read more here . Call a BullAnt Security Technician for the optimum access and security solution for your individual circumstances.